The History of Dampcon from 1985 to now. Ek het you email by Elria gekry en will regtig uit my hart uit dankie sê vir die werk wat julle gedoen het (ek het die fotos ontvang) en ek voel opreg dankbaar vir dit wat julle alles gedoen het. Ongelooflik baie dankie. The painting of our house has been completed under severe temperature conditions. We are very happy with the quality workmanship and supervision achieved. Thank you. We have used Dampcon on a number of occasions now over the past few years and we have never received anything but great service from Bernard and the Dampcon team. They arrive when they say they are going to arrive, finish within the times promised and have always provided work of very high quality. The site is cleaned every day, the work done accurately and efficiently... On more than one occasion, the team have gone beyond the scope of work and sorted out extra items for us at no additional charge. All in all, we would not hesitate to recommend Dampcon for any water-proofing, damp-proofing or general construction work. i hope this email finds you well. I wanted to thank you for the great service. It was a breath of fresh air dealing with you and your company. I knew in your hands I didn’t have to worry about the job being done. It has been professional from the start and am very happy. Thank you. ...I wanted to thank you and Dampcon for the great service and outstanding work (both the damp proofing and the tiling) that was done. It was so refreshing to deal with a company that delivers on their promise. Too often these days companies over promise and under deliver. Thanks again! Dampcon® was founded by Marius Hanscombe, who since 1974, had been involved in construction and waterproofing. Dampcon® opened its doors, in May 1985, and quickly became recognised as the market leader in damp control and waterproofing. The business evolved and the need to create our own products was identified in the early nineties. Dampcon® has since manufactured our own waterproofing compounds, plaster additives and injection fluids, ensuring that our stringent quality standards are met from raw material to finished project. Dampcon® won the first Business Achievement Awards presented by Germiston Chamber of Business and Price Waterhouse. The start of the new millennium brought about changes with Dampcon® becoming a family business and the start of a trend towards commercial and industrial projects with an ever-increasing focus on BEE and site safety. Today, Dampcon® is a second-generation family business, focused on expansion whilst maintaining an excellent relationship with every customer by delivering five-star service. 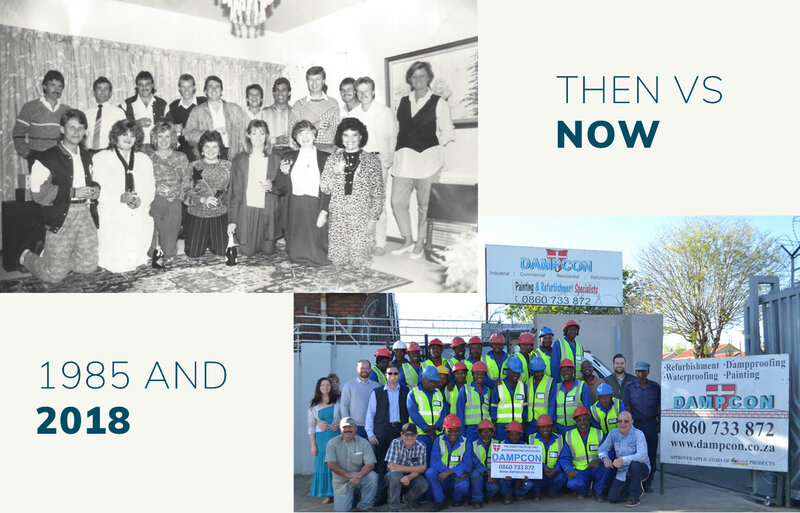 We are proud to be an active member of DWASA, the Damp and Waterproofing Association of Southern Africa, to have grown a skilled permanent workforce through training and mentorship, and to be fully BBBEE and OHS compliant.